Located on the NE side of Tallahassee south of Maclay Gardens on the west side of the Thomasville Road corridor, the Villages At Maclay offers exceptional values for a highly coveted section of town. 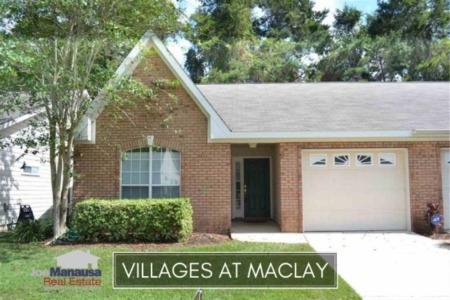 The Villages At Maclay has homes built from the mid to late 1990s, featuring both townhouses and single family detached homes. This means that there is a great fit for nearly any desired style of home from $150,000 to $250,000. 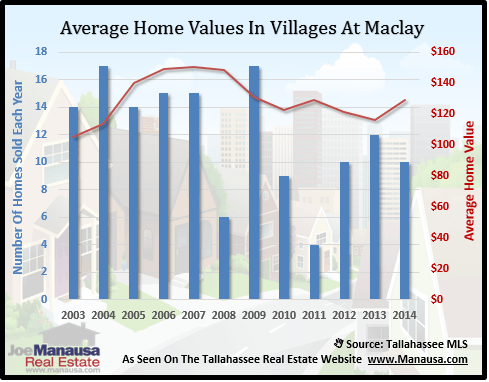 In this report, we will look at prices, values, and sizes of homes in the Villages At Maclay, as well as show current listings in the Tallahassee MLS and all closed home sales going back to 2002. For all of the graphs found in this report, you will find the number of closed home sales for each year (blue columns, measured on the left vertical axis), and an important real estate statistic shown in red (measured on the right vertical axis. It is important to note that sales are through December for all previous years, but through October in 2014. Average home prices have dipped slightly in 2014, and the average price is only marginally higher than the low set in 2010. Distressed sales are are occurring at a rate far lower than most other neighborhoods in Tallahassee, which is the most likely reason that home prices have not budged much over the past five years. 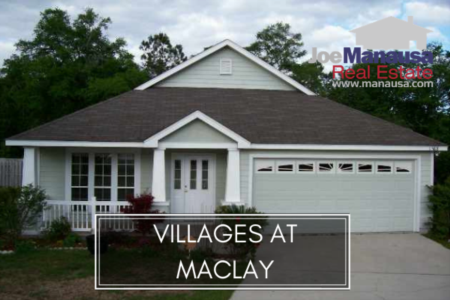 The average recorded sales price is $182,000 for the Villages At Maclay thus far in 2014. Home sales activity this year appears to be consistent with what we have seen over the past seven years, but still below the levels recorded during the most active years from 2002 through 2007. Thus far in 2014, there have been 10 closed home sales in the Villages At Maclay. 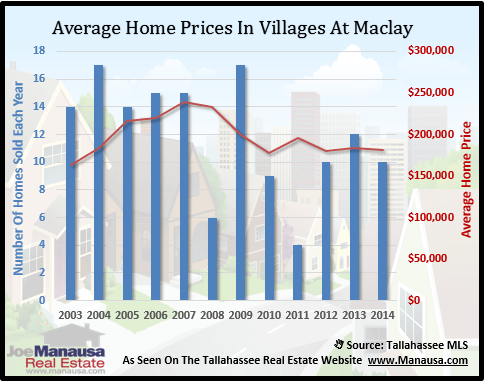 Average home values in the Villages At Maclay have risen 11% since last year, recovering all of the declines that were given up by sellers over the past two years. Through October, the average value of a home sold in the Villages At Maclay has been $129 per square foot. This is down 14% from the market high set back in 2007. This puts the Villages at Maclay near the top of the list for performance in the housing market recovery. 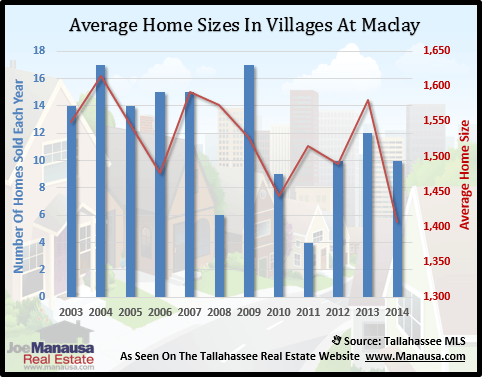 The average home size sold in the Villages At Maclay typically falls in a range of 1,400 to 1,600 square feet, and this year home size averages are at a record low. The 10 sales thus far in 2014 have averaged 1,407 square feet. The following list of homes are the most recent listings in the Villages at Maclay. The following list shows home sales going back to 2002 in the Villages At Maclay. I hope you enjoyed our November 2014 update on home sales in the Villages At Maclay, please feel free to drop me a note if you have questions not covered in this report.